Download "Acute myeloid leukemia (AML)"
1 Acute myeloid leukemia (AML) Adult acute myeloid leukemia (AML) is a type of cancer in which the bone marrow makes abnormal myeloblasts (a type of white blood cell), red blood cells, or platelets. Adult acute myeloid leukemia (AML) is a cancer of the blood and bone marrow. This type of cancer usually gets worse quickly if it is not treated. It is the most common type of acute leukemia in adults. 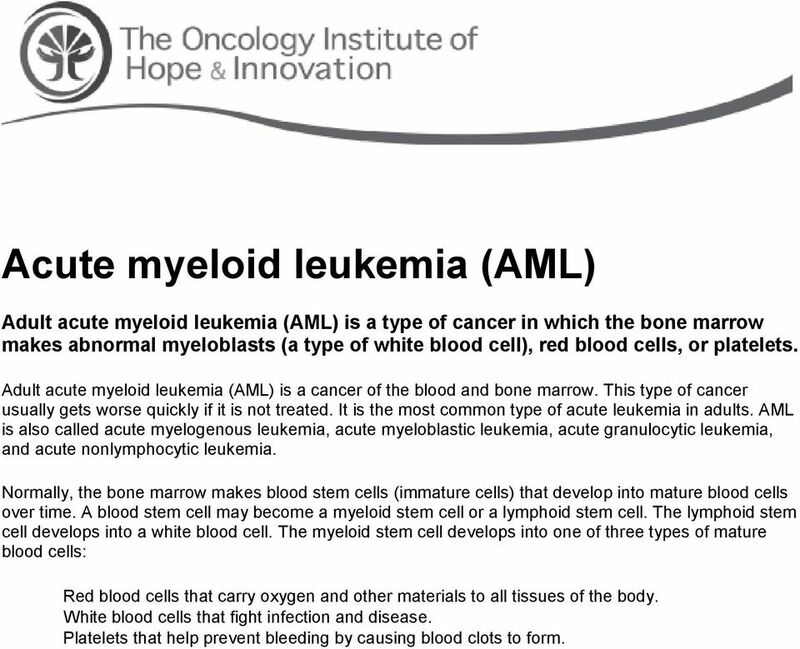 AML is also called acute myelogenous leukemia, acute myeloblastic leukemia, acute granulocytic leukemia, and acute nonlymphocytic leukemia. Normally, the bone marrow makes blood stem cells (immature cells) that develop into mature blood cells over time. 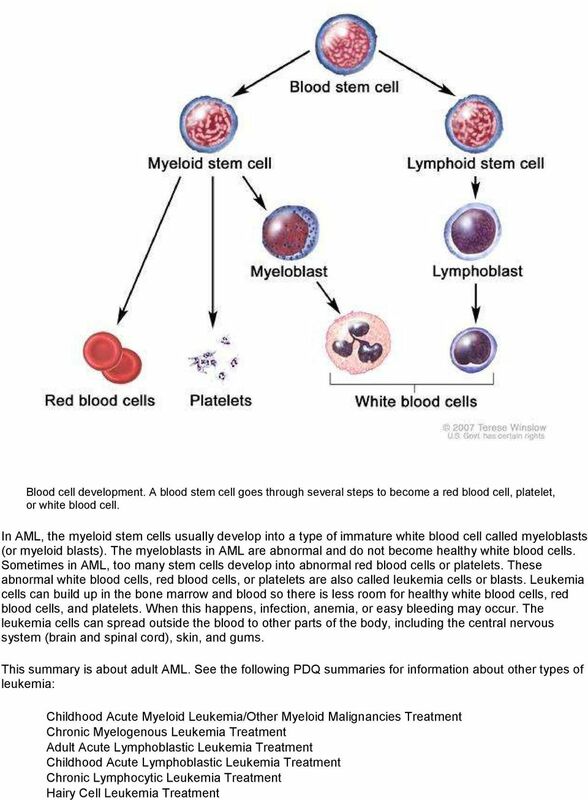 A blood stem cell may become a myeloid stem cell or a lymphoid stem cell. The lymphoid stem cell develops into a white blood cell. The myeloid stem cell develops into one of three types of mature blood cells: Red blood cells that carry oxygen and other materials to all tissues of the body. White blood cells that fight infection and disease. Platelets that help prevent bleeding by causing blood clots to form. 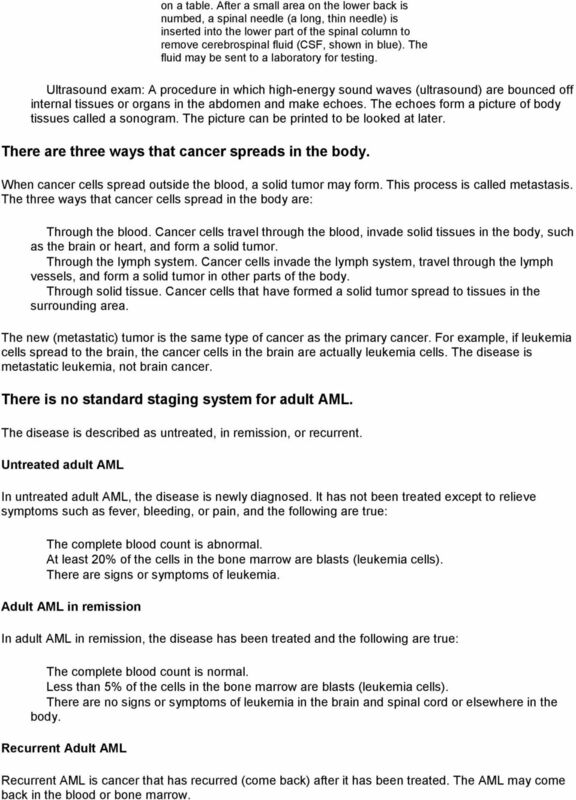 3 There are different subtypes of AML. Most AML subtypes are based on how mature (developed) the cancer cells are at the time of diagnosis and how different they are from normal cells. Acute promyelocytic leukemia (APL) is a subtype of AML that occurs when parts of two genes stick together. APL usually occurs in middle-aged adults. Symptoms of APL may include both bleeding and forming blood clots. Smoking, previous chemotherapy treatment, and exposure to radiation may affect the risk of developing adult AML. Anything that increases your risk of getting a disease is called a risk factor. Having a risk factor does not mean that you will get cancer; not having risk factors doesn t mean that you will not get cancer. People who think they may be at risk should discuss this with their doctor. Possible risk factors for AML include the following: Being male. Smoking, especially after age 60. Having had treatment with chemotherapy or radiation therapy in the past. Having had treatment for childhood acute lymphoblastic leukemia (ALL) in the past. Being exposed to atomic bomb radiation or the chemical benzene. Having a history of a blood disorder such as myelodysplastic syndrome. Possible signs of adult AML include fever, feeling tired, and easy bruising or bleeding. The early signs of AML may be like those caused by the flu or other common diseases. A doctor should be consulted if any of the following problems occur: Fever. Shortness of breath. Easy bruising or bleeding. Petechiae (flat, pinpoint spots under the skin caused by bleeding). Weakness or feeling tired. Weight loss or loss of appetite. Tests that examine the blood and bone marrow are used to detect (find) and diagnose adult AML. The following tests and procedures may be used: Physical exam and history: An exam of the body to check general signs of health, including checking for signs of disease, such as lumps or anything else that seems unusual. A history of the patient s health habits and past illnesses and treatments will also be taken. Complete blood count (CBC): A procedure in which a sample of blood is drawn and checked for the following: The number of red blood cells, white blood cells, and platelets. The amount of hemoglobin (the protein that carries oxygen) in the red blood cells. The portion of the sample made up of red blood cells. 4 Complete blood count (CBC). Blood is collected by inserting a needle into a vein and allowing the blood to flow into a tube. The blood sample is sent to the laboratory and the red blood cells, white blood cells, and platelets are counted. The CBC is used to test for, diagnose, and monitor many different conditions. Blood chemistry studies: A procedure in which a blood sample is checked to measure the amounts of certain substances released into the blood by organs and tissues in the body. An unusual (higher or lower than normal) amount of a substance can be a sign of disease in the organ or tissue that makes it. Peripheral blood smear: A procedure in which a sample of blood is checked for the presence of blast cells, number and kinds of white blood cells, the number of platelets, and changes in the shape of blood cells. Bone marrow aspiration and biopsy: The removal of bone marrow, blood, and a small piece of bone by inserting a hollow needle into the hipbone or breastbone. A pathologist views the bone marrow, blood, and bone under a microscope to look for signs of cancer. 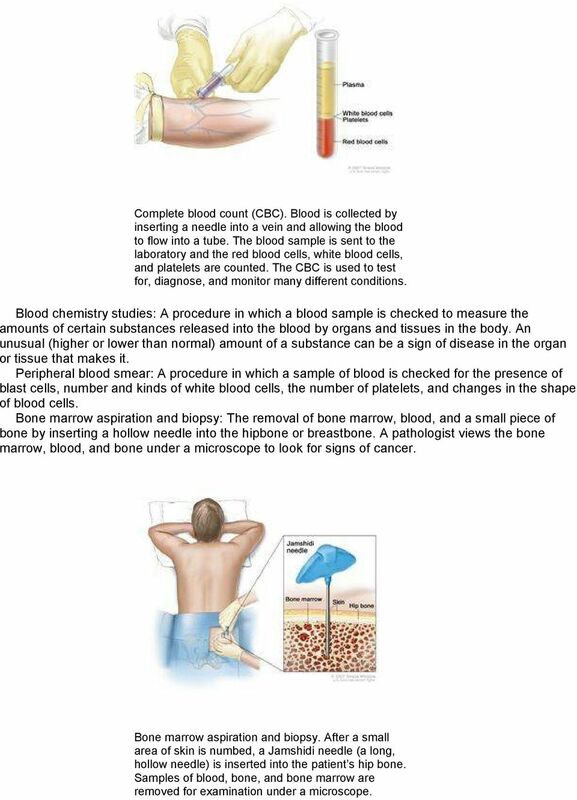 Bone marrow aspiration and biopsy. After a small area of skin is numbed, a Jamshidi needle (a long, hollow needle) is inserted into the patient s hip bone. Samples of blood, bone, and bone marrow are removed for examination under a microscope. 6 on a table. After a small area on the lower back is numbed, a spinal needle (a long, thin needle) is inserted into the lower part of the spinal column to remove cerebrospinal fluid (CSF, shown in blue). The fluid may be sent to a laboratory for testing. Ultrasound exam: A procedure in which high-energy sound waves (ultrasound) are bounced off internal tissues or organs in the abdomen and make echoes. The echoes form a picture of body tissues called a sonogram. The picture can be printed to be looked at later. There are three ways that cancer spreads in the body. When cancer cells spread outside the blood, a solid tumor may form. This process is called metastasis. The three ways that cancer cells spread in the body are: Through the blood. Cancer cells travel through the blood, invade solid tissues in the body, such as the brain or heart, and form a solid tumor. Through the lymph system. Cancer cells invade the lymph system, travel through the lymph vessels, and form a solid tumor in other parts of the body. Through solid tissue. Cancer cells that have formed a solid tumor spread to tissues in the surrounding area. The new (metastatic) tumor is the same type of cancer as the primary cancer. For example, if leukemia cells spread to the brain, the cancer cells in the brain are actually leukemia cells. The disease is metastatic leukemia, not brain cancer. There is no standard staging system for adult AML. The disease is described as untreated, in remission, or recurrent. Untreated adult AML In untreated adult AML, the disease is newly diagnosed. It has not been treated except to relieve symptoms such as fever, bleeding, or pain, and the following are true: The complete blood count is abnormal. At least 20% of the cells in the bone marrow are blasts (leukemia cells). There are signs or symptoms of leukemia. Adult AML in remission In adult AML in remission, the disease has been treated and the following are true: The complete blood count is normal. Less than 5% of the cells in the bone marrow are blasts (leukemia cells). There are no signs or symptoms of leukemia in the brain and spinal cord or elsewhere in the body. Recurrent Adult AML Recurrent AML is cancer that has recurred (come back) after it has been treated. 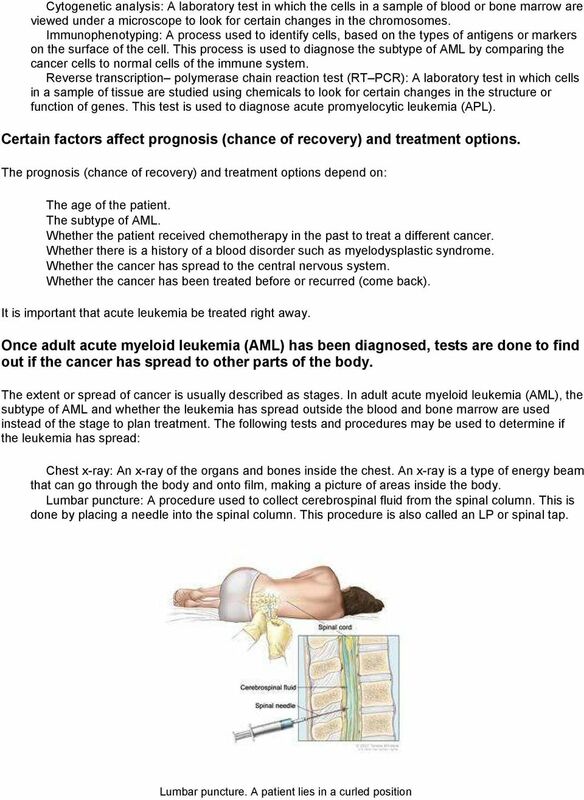 The AML may come back in the blood or bone marrow. 7 There are different types of treatment for patients with adult acute myeloid leukemia. Different types of treatment are available for patients with adult acute myeloid leukemia (AML). Some treatments are standard (the currently used treatment), and some are being tested in clinical trials. A treatment clinical trial is a research study meant to help improve current treatments or obtain information on new treatments for patients with cancer. When clinical trials show that a new treatment is better than the standard treatment, the new treatment may become the standard treatment. Patients may want to think about taking part in a clinical trial. Some clinical trials are open only to patients who have not started treatment. 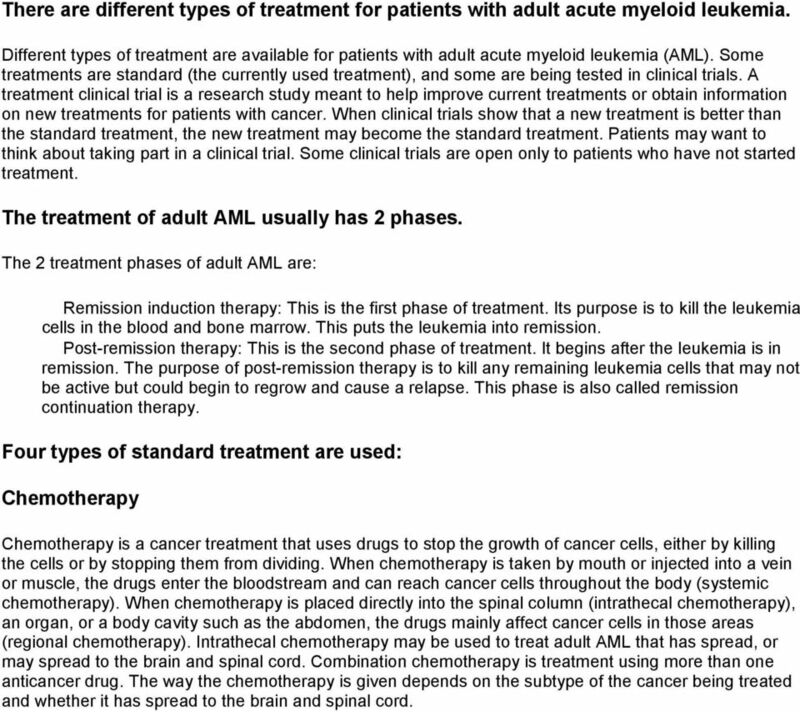 The treatment of adult AML usually has 2 phases. The 2 treatment phases of adult AML are: Remission induction therapy: This is the first phase of treatment. Its purpose is to kill the leukemia cells in the blood and bone marrow. This puts the leukemia into remission. Post-remission therapy: This is the second phase of treatment. It begins after the leukemia is in remission. The purpose of post-remission therapy is to kill any remaining leukemia cells that may not be active but could begin to regrow and cause a relapse. This phase is also called remission continuation therapy. Four types of standard treatment are used: Chemotherapy Chemotherapy is a cancer treatment that uses drugs to stop the growth of cancer cells, either by killing the cells or by stopping them from dividing. When chemotherapy is taken by mouth or injected into a vein or muscle, the drugs enter the bloodstream and can reach cancer cells throughout the body (systemic chemotherapy). When chemotherapy is placed directly into the spinal column (intrathecal chemotherapy), an organ, or a body cavity such as the abdomen, the drugs mainly affect cancer cells in those areas (regional chemotherapy). Intrathecal chemotherapy may be used to treat adult AML that has spread, or may spread to the brain and spinal cord. Combination chemotherapy is treatment using more than one anticancer drug. The way the chemotherapy is given depends on the subtype of the cancer being treated and whether it has spread to the brain and spinal cord. 8 Intrathecal chemotherapy. Anticancer drugs are injected into the intrathecal space, which is the space that holds the cerebrospinal fluid (CSF, shown in blue). There are two different ways to do this. One way, shown in the top part of the figure, is to inject the drugs into an Ommaya reservoir (a dome-shaped container that is placed under the scalp during surgery; it holds the drugs as they flow through a small tube into the brain). The other way, shown in the bottom part of the figure, is to inject the drugs directly into the CSF in the lower part of the spinal column, after a small area on the lower back is numbed. Radiation therapy Radiation therapy is a cancer treatment that uses high-energy x-rays or other types of radiation to kill cancer cells or keep them from growing. There are two types of radiation therapy. External radiation therapy uses a machine outside the body to send radiation toward the cancer. Internal radiation therapy uses a radioactive substance sealed in needles, seeds, wires, or catheters that are placed directly into or near the cancer. The way the radiation therapy is given depends on the type and stage of the cancer being treated. Stem cell transplant Stem cell transplant is a method of giving chemotherapy and replacing blood-forming cells that are abnormal or destroyed by the cancer treatment. Stem cells (immature blood cells) are removed from the blood or bone marrow of the patient or a donor and are frozen and stored. After the chemotherapy is completed, the stored stem cells are thawed and given back to the patient through an infusion. These reinfused stem cells grow into (and restore) the body's blood cells. 10 whether to continue, change, or stop treatment may be based on the results of these tests. This is sometimes called re-staging. Some of the tests will continue to be done from time to time after treatment has ended. 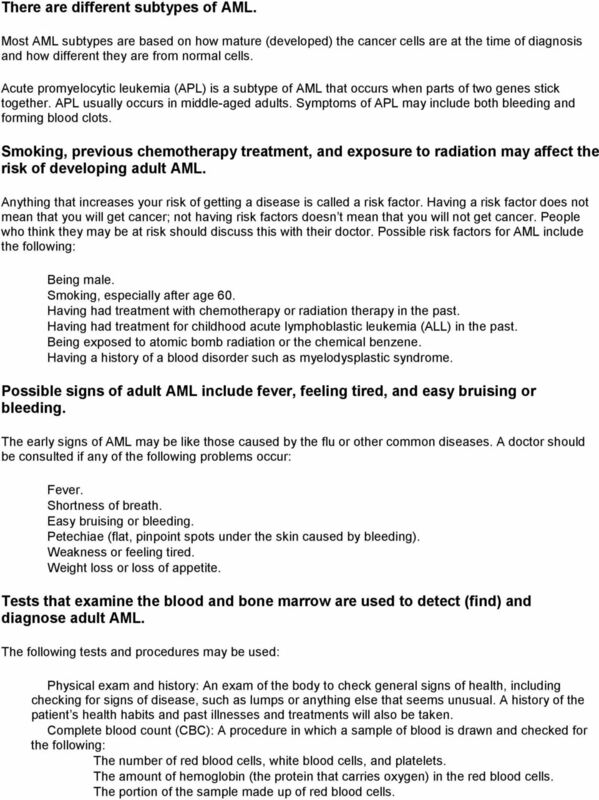 The results of these tests can show if your condition has changed or if the cancer has recurred (come back). These tests are sometimes called follow-up tests or check-ups. Treatment Options for Adult Acute Myeloid Leukemia Untreated Adult Acute Myeloid Leukemia Adult Acute Myeloid Leukemia in Remission Recurrent Adult Acute Myeloid Leukemia A link to a list of current clinical trials is included for each treatment section. For some types or stages of cancer, there may not be any trials listed. Check with your doctor for clinical trials that are not listed here but may be right for you. Untreated Adult Acute Myeloid Leukemia Standard treatment of untreated adult acute myeloid leukemia (AML) during the remission induction phase depends on the subtype of AML and may include the following: Combination chemotherapy. High-dose combination chemotherapy. Low- dose chemotherapy. 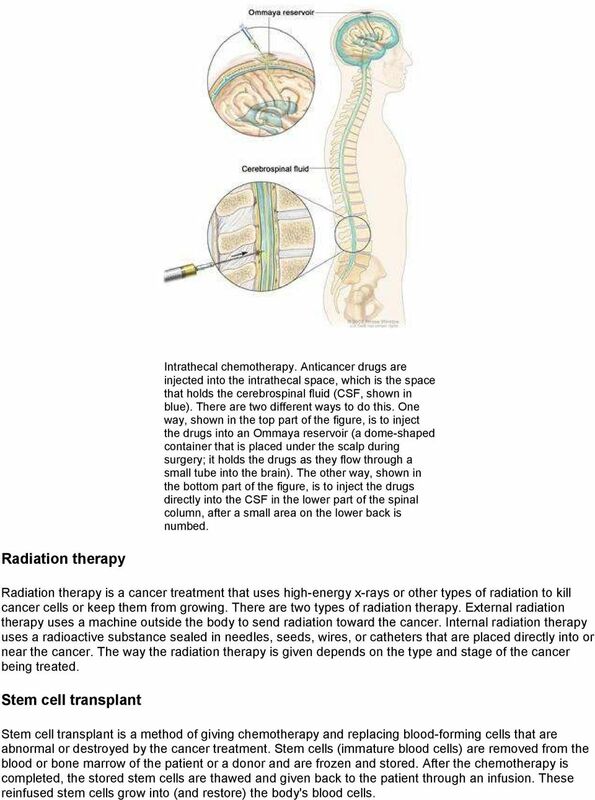 Intrathecal chemotherapy. All-trans retinoic acid (ATRA) plus chemotherapy for the treatment of acute promyelocytic leukemia (APL). Check for U.S. clinical trials from NCI's PDQ Cancer Clinical Trials Registry that are now accepting patients with untreated adult acute myeloid leukemia. For more specific results, refine the search by using other search features, such as the location of the trial, the type of treatment, or the name of the drug. 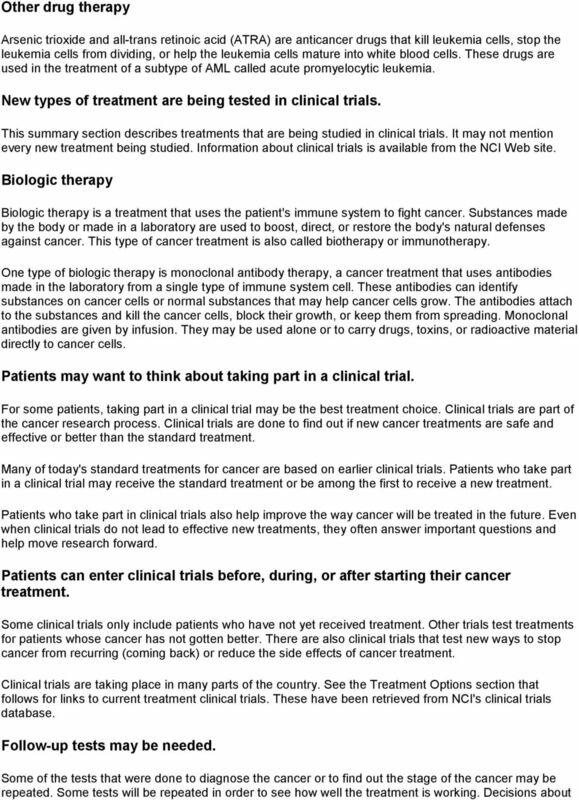 General information about clinical trials is available from the NCI Web site. 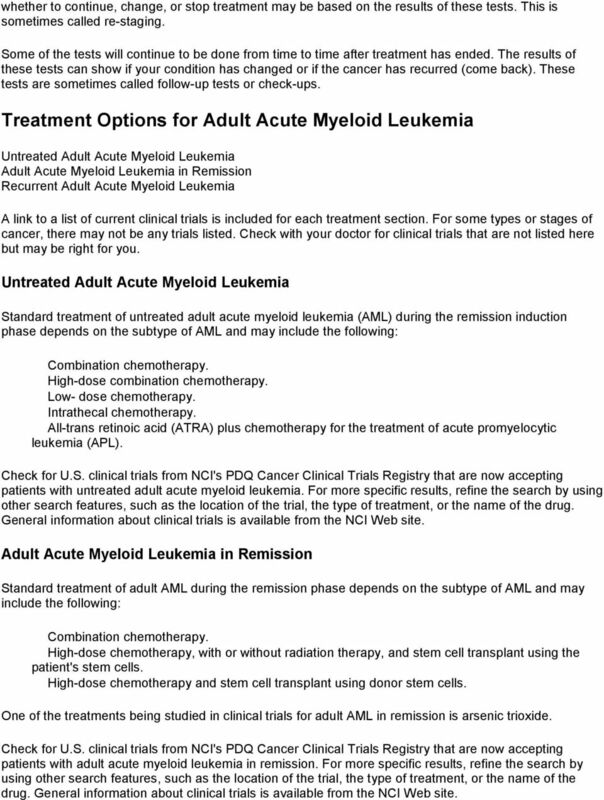 Adult Acute Myeloid Leukemia in Remission Standard treatment of adult AML during the remission phase depends on the subtype of AML and may include the following: Combination chemotherapy. High-dose chemotherapy, with or without radiation therapy, and stem cell transplant using the patient's stem cells. High-dose chemotherapy and stem cell transplant using donor stem cells. One of the treatments being studied in clinical trials for adult AML in remission is arsenic trioxide. Check for U.S. clinical trials from NCI's PDQ Cancer Clinical Trials Registry that are now accepting patients with adult acute myeloid leukemia in remission. For more specific results, refine the search by using other search features, such as the location of the trial, the type of treatment, or the name of the drug. General information about clinical trials is available from the NCI Web site. 11 Recurrent Adult Acute Myeloid Leukemia There is no standard treatment for recurrent adult AML. Treatment depends on the subtype of AML and may include the following: Combination chemotherapy. Biologic therapy with monoclonal antibodies. Stem cell transplant. Arsenic trioxide therapy. What you need to know about. Multiple Myeloma. Based on a brochure from National Institutes of Health National Cancer Institute STDAVIDS. M6-1 NOTE. Each major learning point is clearly identified by boldface type throughout the guide and emphasized in the PowerPoint presentation. Lymphoma. Starting Point. Diagnosed with Lymphoma? Leukaemia and lymphoma what s the difference? Who is affected by HCL and what causes it? Leukemia Acute Lymphocytic (Adults) What is acute lymphocytic leukemia?